Pesto is a sauce that can be used as a sauce for pasta or meat, or can be used as an ingredient in a variety of dishes. One classic use is to spread the pesto onto slices of bread which are then toasted. The word "pesto" derives from the Italian for pestle, pestello. This recipe substitutes Romano cheese for the usual Parmesan. 1/3 cup freshly grated Pecorino Romano or Parmigiano-Reggiano cheese or a 1:1 mixture. Preheat the oven to 425 °F (220 °C). If using, Toast the pine nuts in an ovenproof pan for 10-15 minutes, checking every 5 minutes to prevent excessive browning or burning. In a small frying pan (skillet), heat 2 tbsp of the olive oil on medium heat. Crush the garlic and saute in the oil until soft, about 2-3 minutes. Combine the basil, garlic, cheese, pine nuts and oil in a mortar and pestle until it forms a smooth paste, or use a food processor or blender and chop finely, slowly adding the oil to reach the paste-like consistency. The Pesto sauce can be used immediately, covered with a thin layer of olive oil and refrigerated in an airtight container for one week, or frozen for several months. The cheese can be omitted to allow longer storage, as it is the most likely ingredient to spoil. Grated cheese can then be added before use. It’s possible to store it in jars for longer, but it’s advisable to add a little extra olive oil on top of the filled jar, otherwise the top of your pesto will turn brown as it oxidizes in the air. 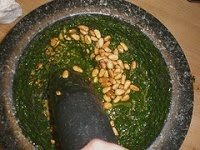 Traditionally, a mortar and pestle is used to make the sauce. The crushing action of the mortar and pestle produces a more intense flavour than the chopping action of a food processor. If using a food processor you can simulate the additional flavor given by the mortar and pestle method by placing the basil leaves in a plastic bag and crushing them with a rubber mallet or rolling pin prior to use. Good quality Parmesan cheese may replace the Pecorino for a milder taste. Crumbled feta cheese also works well for a different taste. A common change to the recipe is to replace some or all of the pine nuts with sunflower seeds, walnuts, pistachios or almonds. This significantly reduces the cost of the sauce. Besides being cheaper, it is also necessary for people with nut allergies. 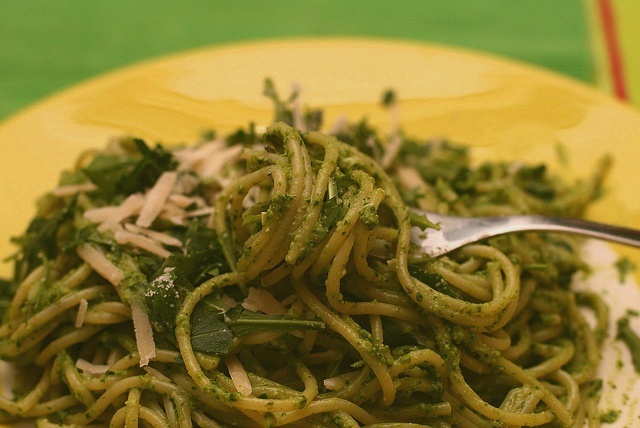 For a creamy sauce, take two tablespoons of the pesto in a pan and heat on medium-low. Add one cup light cream and bring to a simmer. Use for pasta. Serves two. The pine nuts can be replaced with an equal quantity of sun-dried tomatoes. You may change the taste by changing the base of the pesto from basil to other easily obtained herbs/vegetables. Some variations include using cilantro (coriander, for a more aromatic taste) or spinach (more "bang for your buck", as spinach is much cheaper than basil, yet still has its own distinct flavor). Try to mix up the standard basil/garlic combo by introducing shallots (sweet onions) into the mix, as it adds a slightly sweet taste to the paste. Mix fresh chives, marjoram and thyme with the basil to produce something akin to Valdostano-style pesto. Another variant replaces the basil with equal parts of leaf parsley and spring onions. Arugula may also be substituted for basil with surprising, spicy results. For another variation of a creamy sauce, add cream cheese to the recipe. A vegan variation can be made by mixing walnuts, fresh basil, olive oil and small amounts (such as a table spoon per cup) of white miso paste. i used peanut instead for this pesto sauce. worked well too! i hate pesto. taste horrible!